Is a perfect key logger and keystroke logger software - easy to use solution for PC and internet surveillance, a new generation key logger & keystroke Loggger software which is absolutely undetectable ! Perfect Key logger is a new key logger and keystroke logger software for PC and Internet surveillance has become very popular recently. 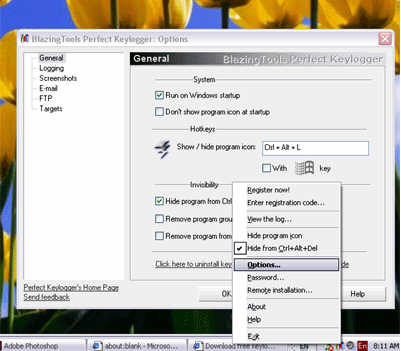 Perfect Key logger is a powerful and easy to use solution for PC surveillance. Perfect Key logger is an extremely compact, award-winning key logger and keystroke logger software. It is translated into 20 languages and is increasingly popular around the world! It lets you record all keystrokes, the time they were made and the application where they were entered. It works in the absolutely stealth mode. Stealth mode means that no button or icon is present in the Task Bar, and no process title is visible in the Task Manager list. One of the most powerful features of Perfect Key Logger is its advanced Keyword Detection and Notification. Create a list of "on alert" words or phrases and key logger will continually monitor keyboard typing, URLs and web pages for these words or phrases. Perfect Key logger does not send any information to our company. Only you will receive the log files. We guarantee absolute privacy, high quality product and technical support - that's why we have a thousands of satisfied customers! Perfect Key logger is intended to help you in this kind of situation. It can show you exactly what is being done on the computer at any time. Download Perfect Key logger and take the total control of the PC! Uploads ALL logs into the separate folders by FTP (in the stealth mode)! Invisible keylogger - The Most Powerful Invisible keystroke logger software in the World ! Spyware Doctor - Spy Doctor is one of the most popular spyware detector and removal program on the market. Hot! Ardamax Keylogger - keystroke recorder that captures users activity and saves it to a log file, It is a powerful Keystroke Logger for you ! Perfect Keylogger - windows key logger solution for PC and Internet surveillance.